Did anybody see the Summer, this year? I was freezing this past Friday morning, when I went to shop at my local green market. I bought $100 worth of various frozen meats, including beef shanks, from a new vendor, Sun Fed Beef. I guess it’s time to pull out our Fall recipes – I was craving for Ossobuco. Ossobuco should be made with veal shank, but veal is not politically correct. Use the beef, instead; it is equally delicious. 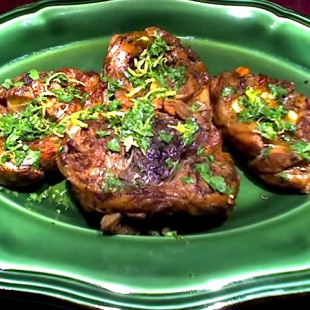 There are many Ossobuco recipes on the Food Network including this one by Tyler Florence, Osso Buco Milanese, awarded with 5 stars. I wasn’t sure whether I should use it: the recipe looks a little complicated, asks for a lot of ingredients, it sounds suspicious because Ossobuco is one word in Italian and it mentions something called Gremolata, which I never heard of before. So I reverted, as I very often do, to my trusted Talismano della Felicita’, the cook book used by our mothers. My Talismano was printed in 1975 (a modern edition, I guess) and was passed to me by my mother, a great cook. Ossobuco alla Milanese from the Talismano della Felicita’, is a very simple recipe. (Gremolada is not mentioned in the recipe nor in the whole book). Click here for the authentic Ossobuco alla Milanese recipe, adapted from Il Talismano della Felicita’. The Ossobuchi (somebody writes Ossibuchi… I don’t think so) came out delicious, accompanied by some just steamed vialone nano rice. Simplicity always wins. The gremolata is the minced lemon rind, garlic, parsley and anchovies applied at very end. There you have it!!! I learned that when I first made ossobuco many moons ago from the recipe in the Time/Life Cookbooks of the World series…which by the way was a good recipe and included gremolata. Grazie, Ann. I supposed so. What confused me is that Tyler Florence includes grated orange rind and does not include the anchovies, in his recipe http://www.foodnetwork.com/recipes/tyler-florence/osso-buco-milanese-recipe/index.html. I never heard of the term Gremolata, before. I called some friends in Italy and asked them, too. They thought it was a mispelling of some sort of Granita; when I told them it should be associated to Ossobuco, they still had no idea. Martina knew what Gremolata referred to, but she is being living in America for 25 years and does not remember whether she learned of it here. Grazie mille. Now I know. But I insist: I want my Gremolata with the anchovies! Grazie for clarifying! I believe the gremolata in the Time-Life recipe (I can’t get to my copy right now) did not include anchovies either, but was composed of lemon rind, parsley and garlic very finely minced. Perhaps someone with access to the book will verify? Perhaps post the whole recipe? Marcella Hazan, the final word on all things related to Italian cooking, includes a reference for gremolada with her Osso buco recipe (in her “classics” cookbook). Although as I recall she says its not commonly used in Italy. By the way, while I love anchovies, there are no anchovies in that recipe.